StarKist® at FNCE® — Booth 1224 for Samples and More! Subject: StarKist® at FNCE® — Booth 1224 for Samples and More! Stop by booth 1224 at FNCE® to sample our NEW Tuna Creations® BOLD and Selects E.V.O.O.™ products and for a chance to win* a Food Photography course! Tuna Creations® BOLD Pouches are deliciously seasoned, ready-to-eat and add a kick of BOLD flavor to any meal or snack. We will be sampling our NEW Tuna Creations® BOLD with Rice and Beans and Tuna Creations® BOLD, Jalapeño. StarKist Selects E.V.O.O.™ packed in cold-pressed extra virgin olive oil is the perfect addition to any meal. Try it on salads, pasta or straight out of the pouch, and taste the delicious E.V.O.O. difference. 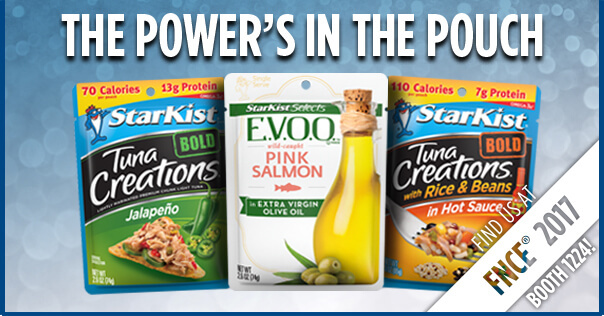 Stop by to try a sample of our NEW StarKist Selects E.V.O.O.™ Pink Salmon in Extra Virgin Olive Oil Pouch! 100 Years Never Tasted So Good! We want to wish a Happy 100th Anniversary to the Academy of Nutrition and Dietetics. We are also celebrating 100 years of being America’s favorite tuna** — what a flavorful century it’s been for both of us! Interested in learning how to artfully photograph your favorite recipes? Visit booth 1224 to enter for a chance to win* a Food Photography course from Story on a Plate! Winners will learn how to style and photograph food like a professional. © 2017 StarKist Co. All Rights Reserved.